Phone to enable "one to many" "walkie talkie" communication. This was beset with dropouts and often users not allocated a channel and missing out on broadcast calls. networks, the data speed through ongoing compression protocols have now made PTToC an attractive alternative to traditional PMR/LMR networks. Web Browsing, Facebook or many other applications that effect the sole purpose of PTT communication. 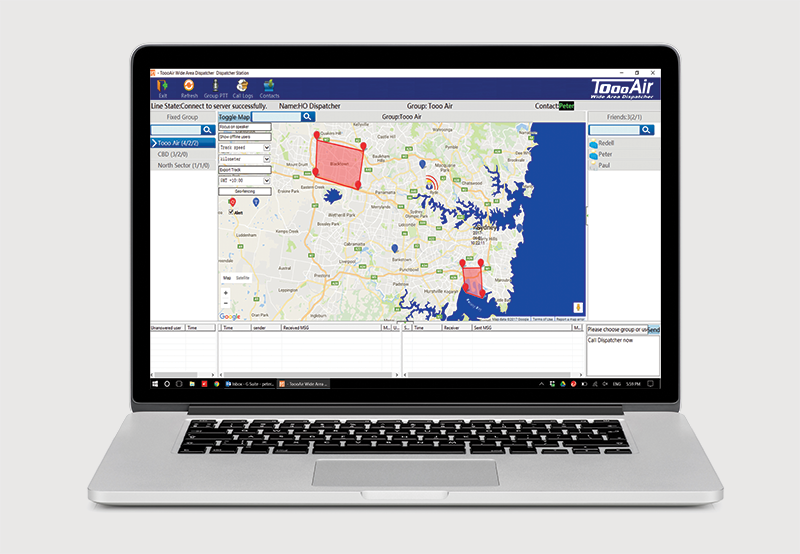 The ToooAir solution brings to the Australian market a hardware and software platform dedicated for Australia Wide coverage. The simplicity of the user interface and ease of use to establish "one to one" and "one to many" communication and broadcast calls is key to the system operation. In addition, compared to most LMR systems, the ToooAir system delivers country wide coverage through the WCDMA Next G 850Mhz network. With over 7000 repeater sites situated around Australia, the network offers unsurpassed urban and rural coverage and improved in-building and in-tunnel reception. geo fencing and network voice record are all included on the ToooAir platform. enables quick and easy access and visibility to all users in your fleet. of the features offered with the ToooAir PTT dispatcher system.